Show your pride for the Water Nation and love of the Avatar series with an elemental hoodie! These super soft and warm fleece hoodies sport the element symbol on the back, with the Water Nation emblem on the shoulder. Celebrate Cardcaptor Sakura’s return to TV by wearing pajamas inspired by her trusty companion, Kero! This onesie comes complete with all of Kero’s features minus the bossy attitude. A great outfit for any Cardcaptor Sakura fan! Light up your bedroom with this super badass display of Frieza performing his most powerful attack! Mounted on Namekian terrain, this interactive plasma ball and Frieza action figure creates an awesome display piece for Dragon Ball Z fans. If you’re a fan of both Pokemon and Dragon Ball Z and can’t decide which one is better, these pins are for you! This series of enamel pins perfectly mashup your favorite Pocket Monsters with Dragon Ball Z fighters. Wear Vegeta’s armor this summer to make you feel strong and fashionable! This tank top from Dragon Ball Z is designed like his battle armor. It’s a cool way to show you’re a true fan of the Prince of Saiyans at the gym. 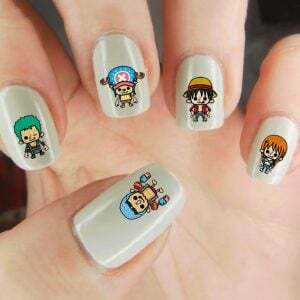 Add some extra glamour to your next manicure by making those smooth and shiny nails really pop with these One Piece decals. The Straw Hat Pirate crew come available in either water slide or peel and apply application. This Zanpakuto may not hold any living spirits but will work as a fully functional and battle ready sword! The expertly crafted replica of Rangiku’s Soul Slayer is made from quality steel that’s capable of cutting through bamboo, bones and Hollows! You know you’re doing something right when your painting is mistaken as one of Vincent Van Gogh’s! This stunning print of an original painting entitled “Van Gogh Never Met His Neighbor” makes an excellent addition to any wall of a Studio Ghibli fan. Evolve your sticker collection to the next level with these stunning Evolution Stones! Available in an optional holographic finish, you’ll be able to see some of the Pokemon affected by the stone if you take a look deep inside the decal.